The US Navy SEALs have a virtually unlimited training budget and very generous range time. Even so, they do dry fire training at home every night FOR WEEKS before they get to fire their first live round. It's a similar story for other special operations units and tactical law enforcement. What you've got to ask yourself is, if the best shooters in the world use dry fire training, shouldn't you? It’s simple to order. You get both online-on-demand access as well as the DVD so you can begin training in the next 5 minutes! You don’t need any special tools or gear to get started…you just need to be a responsible adult who can legally own a firearm and who can safely and responsibly handle it. Spend just 5-15 minutes per day watching and following along with the dry fire drills in the comfort and privacy of your home. The drills use cutting edge neuroscience and accelerated learning techniques to slash the amount of time you need to spend training. Most shooters see dramatic results within the first 3-5 days. And in 21 days, you’ll see the same kind of results that thousands of military, law enforcement, and responsibly armed civilians have seen—unshakable confidence and performance from the range to the street. What makes the training so different? Our unique approach combines cutting edge brain science with proven 2,500 year old martial arts training techniques. That’s why it works so well for everyone from brand new shooters to tip-of-the-spear warriors…regardless of what they’ve tried before. The follow-along video training is so fun and so easy, it’ll quickly become a highlight of your day! The science in the training is incredibly powerful, but simple enough that anyone with a 6th grade education can get great results. 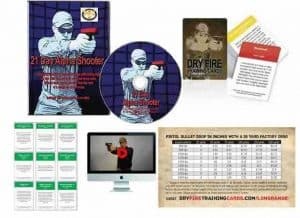 The complete video training package and $141 in bonuses costs less than a single trip to the range (ammo, range fees, fuel, etc.) and WAY less than a single session with a private instructor. 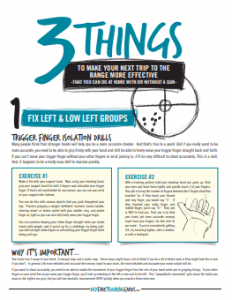 Since the follow-along dry fire drills are so powerful, you only need to practice 5-10 minutes at a time in the comfort of your living room to see quick, dramatic improvement. In fact, we suggest that you avoid practicing any more than 15 minutes per day. That’s about an hour a week to get the kind of results that most shooters spend their entire lives wishing they had. We've helped more than 10,000 shooters shoot better with our cutting edge at-home training. From retired women getting their first gun to competitive shooters to guys leaving a career in special operations, our training has helped them have more confidence and better performance in a fraction of the time and cost as traditional live fire training methods. 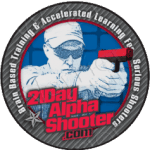 Regardless of where you're at as a shooter, this training is the next step. It's the most efficient, effective, and inexpensive way to become the shooter you've always wanted to be. The shooter you KNOW you need to be. You can be the shooter who can perform at a high level at the range as well as under extreme stress. You can be the shooter who your friends will admire and your loved ones can depend on. Go to almost any range and you'll find shooters who are happy to just hit the target. But that kind of performance just isn't acceptable when you've got loved ones or innocents depending on you. 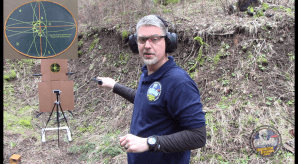 The fact is, most shooters don't have the time or money to do enough traditional live fire training to prepare for stressful shooting situations. But, I don't believe that life-saving shooting performance should be limited to those with unlimited training budgets. From here on out, after completing this training, every round you send downrange...whether it's for fun, competition, or saving a life...will be quicker and more accurate. We'll give you the earned confidence of knowing you can send a round exactly where you need it to go with a defensive pistol, regardless of the situation. And you'll become the shooter you've always wanted to be. Dry fire training is the secret of top performers. It’s the manipulation of your pistol with no live ammo present. Done correctly (I’ll show you), it’s safe for all modern defensive pistols. Best of all, it means that you can practice without paying for ammo in the comfort of your own home! Normal dry fire is good. Our dry fire drills use cutting edge brain science to slash the amount of time you need to spend practicing to make the gains you want. Simple. Easy. Powerful. All you do is follow along and copy what you see on the video–just like a follow-along exercise video. It’s like having a private instructor come over to your house every day to work with you…only at a fraction of the price. Have you ever forgotten something you’ve learned? I have. But when you’ve got a video you can refer back to, for free, any time you forget a detail, you’ll always be able to practice perfectly from this day forward. 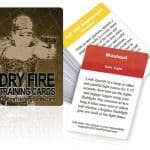 You’ll also get a set of Dry Fire Training Cards to use for followup training. They’re a deck of 50+ dry fire drills printed conveniently on playing cards so that you’ll always have a variety of fun, effective drills to do any time you want. This training system amounts to a complete 2-3 day course that would cost hundreds of dollars to attend. And in just a few minutes a day, in the comfort of your home, I'll teach you how to rapidly become the shooter who everyone knows they can depend on using tested and validated accelerated learning techniques. How much have you spent on ammo, training, and gear so far without seeing the results you want to see? Are you seeing dramatic improvements every time you go to the range? Are you doing more and more of the same and expecting a different result? How much of your current training is simply reinforcing mediocre performance instead of elevating your game? If you had to use your pistol to defend yourself or those you love TONIGHT, would you wish you'd done anything differently...better? You see, not using our system has an immediate cost, because your range time isn't as effective or as fun as it could be. But there's also a bigger potential cost of not using our training...and it could be the life of someone you love. What if you don't take action today? Chances are good that nothing will change. You’ll shoot the same next week, next month, and next year as you do right now. And, if that was good enough, you wouldn’t be reading this right now, would you? If you don’t take action, you’ll still have the same nagging fears about whether or not you’ll be able to perform when your life and the lives of those you love depend on it. You're not going to find a quicker solution. You're not going to find a less expensive solution. This will give you the most bang for the buck of any training option available, so go ahead and get started now by clicking the button below.